This view shows the front of the knee with the knee joint bent. The ligaments, tendons and muscles surrounding the knee joint support and strengthen it. The tibial and femoral condyles are covered by articular cartilage and are cushioned and supported by the menisci. 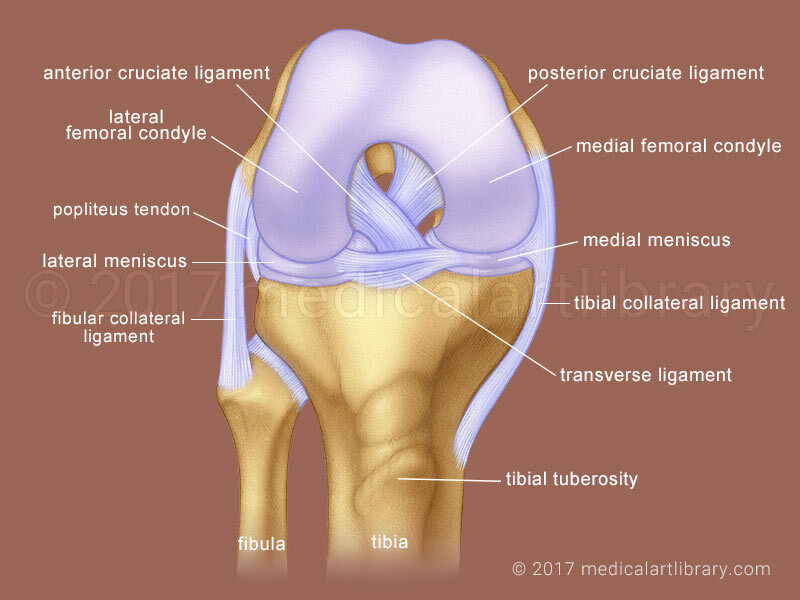 The tibial collateral ligament on the inside of the leg attaches from the tibia to the femur and to the medial border of the medial meniscus. This is often the site of injury to the medial meniscus when the tibial collateral ligament is torn. The transverse ligament connects the medial menicus to the lateral meniscus. The fibular collateral ligament attaches from the femur to the head of the fibula. In the center of the knee joint are the anterior and posterior cruciate ligaments which cross each other like an X. A blow to the lateral side of the knee can cause tearing of the tibial collateral ligament, anterior cruciate ligament and medial meniscus. This is the most common type of knee injury in football.